How Dangerous is Water Damage on Your Deck? Water is such a simple thing. It’s clear and clean, but it’s amazing how much damage it will do! Mountains of rock are changed and moved by water. Just imagine what long-term water damage can mean for your beautiful wooden deck. Consider these situations where your exterior structures fall prey to the elements. Water does its damage in a slow and steady way that is barely noticed as it’s happening. A light rain leaves a small puddle and the next day it’s gone, so we think our deck is safe. But that puddle sat for twenty-four hours, soaking into the wood. Perhaps next week there’s another light rain and another puddle does the same. The weight and chemicals and moisture are slowly making a permanent indentation on your deck. Maybe you see very little rain or your deck is covered, so you think you’re safe. Instead you have dew, overnight and every morning. Again moisture is pooling and soaking. Even an hour of moisture, means an hour a day, which is more than an unfinished wooden surface can handle. Moisture attracts dust and other elements that are light enough to hang in the air. They settle in the moist surface and then transfer to it. Maybe a little dirt outside seems harmless, but dirt settles in the cracks of the wood, tiny cracks that haven’t been sealed and can’t even be seen by the human eye. So those cracks fill with the moisture and dirt attracted to the moisture. Whether the crack expands due to the weight of the dirt or the freezing of the water, the cracks are widening and the wood will eventually split. Moisture left to collect and cling without evaporating will turn to mold and mildew. Not only are these substances smelly and ugly, but they will destroy your wood. You never want mold growing near the structure of your home and even a little mildew makes your deck a dangerous place. Deck damage is a serious issue. Wood that has been exposed to the elements over time begins to rot, invites pests and goes from a load bearing structure to a shaky mess. 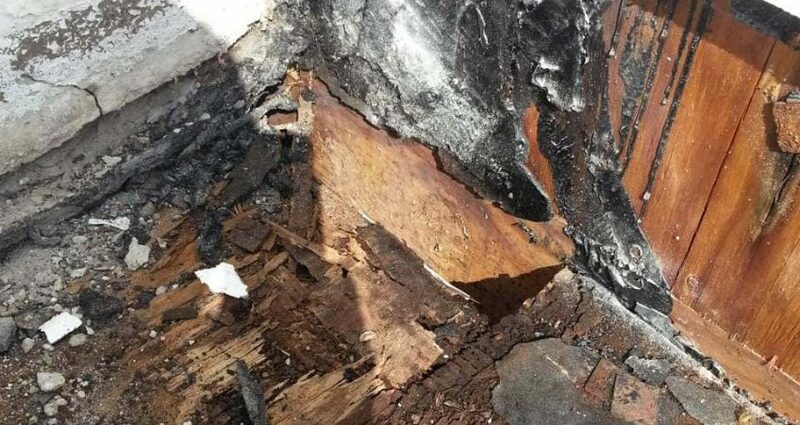 Rotten wood is extremely weak, but may actually look like it’s never changed. Rot can begin from the inside where moisture has been allowed to collect over time. Imagine a loved one stepping on a piece of your rotting deck and falling through. You want your deck to hold beautiful pottery for your plants and flattering furniture for family cookouts. Your rotting deck will hold nothing. Pests that hide in wet wood will make a cozy home and eat away at the good wood that the moisture hasn’t yet reached. They are attracted by the wet crevices where bacteria has begun to grow. No one wants to share their deck space with these guys! If your deck is adjacent to your home, never underestimate the fact that construction is attached to your house. This makes the dangers of poor deck maintenance can quickly become a danger to the must bigger investment that houses your life and family. Your home and your deck, whether attached or surrounding a pool or patio are huge investments that warrant protection. The extra expense that prevents these risks will pay for itself in the first year. All of these concerns can be avoided by building a waterproof deck and maintaining its surface for years to come. Treated surfaces are also easier to keep clean and maintain their appearance longer than natural wood that has succumbed to nature. Contact us to help see that your next new deck is your best and your last.